Okay, scheduling more than one person for a meeting is hard. Millions of electrons give their lives for the countless numbers of emails saying stuff like “Hey can you do Monday at 10:00”, “No howbout Tuesday at 3:00”, “That doesn’t work for me”; which led to tools, perhaps the most popular being Doodle that allowed for meeting polls. Microsoft likes to keep up with the Joneses, or, in this case, the Doodles. One way they do keep up is by purchasing, like they did with MileIQ. The other way is that they do things in-house, which is the case with FindTime, written by the experimental folks at Microsoft Garage. 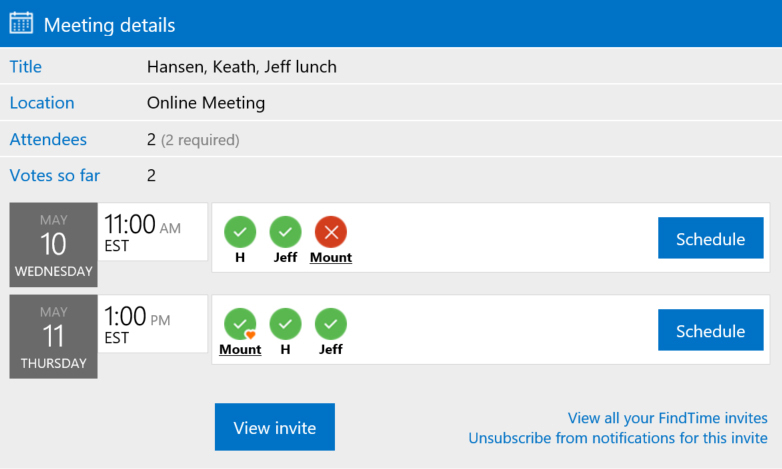 FindTime is a meeting polling add-in for Outlook that helps suggest the best meeting times. The cool thing is, of course, it is integrated with Office 365 and will suggest the best meeting times for each recipient in your organization. Of course, it doesn’t know the status of attendees outside your organization (but I bet they are working on it). Here’s a one-minute intro on YouTube. It is worth a look. Protip: Avoid using the “calendar hold” feature, it can lead to clutter in the attendees’ calendars. I really like this tool, and I think you will, too. This entry was posted in Microsoft Office. Bookmark the permalink. Follow any comments here with the RSS feed for this post. Post a comment or leave a trackback: Trackback URL.